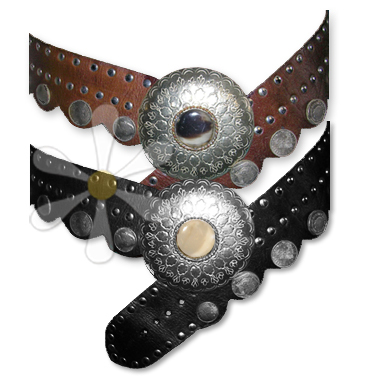 This belt features a scalloped edge decorated with either genuine global coins or sometimes hand-hammered discs, rows of metal studs and a gorgeous etched buckle, often with a naturally patterned agate stone cabochon. Crafted in Morocco of the soft tanned leather for which their craftsman have been known the world over for centuries... PERFECT!